The eighth-generation Toyota Camry Hybrid goes on sale in India; gets a new, more powerful engine and the brand's 4th-gen hybrid system. 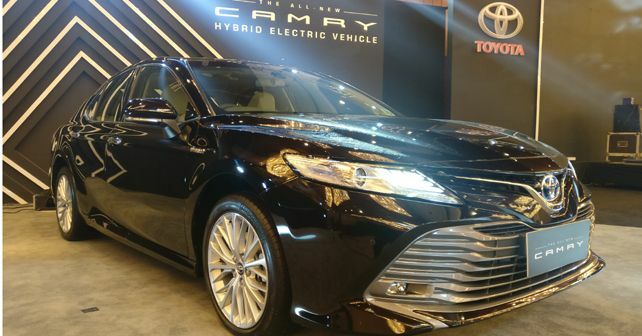 Toyota has launched the new generation of its Camry Hybrid in India at an introductory price of Rs ₹ 36.95 lakh (ex-showroom). This puts the new car's ex-showroom price lower than the outgoing model. It is based on the company's TNGA (Toyota New Global Architecture) platform which it shares with the seventh-generation Lexus ES. The new platform allows the sedan to be 35mm longer and 15mm wider than the outgoing model. While the overall height has been lowered by 15mm, the wheelbase has been elongated by 50mm. The new platform and the increase in overall dimensions have also resulted in an additional 10 litres of boot space. Unlike its predecessor, the new Camry has only been launched with a hybrid version. At the heart, the Camry Hybrid gets a new 2.5-litre four-cylinder 'Dynamic Force' petrol motor. Revised power and torque figures now stand at 176bhp and 221Nm. The motor works in tandem with the fourth-generation Toyota Hybrid System, which adds 118bhp and 204Nm of torque from the electric motor. The powertrain is mated to a 6-speed Continuously Variable Transmission (CVT) gearbox and thanks to the lighter chassis, the new Camry has a claimed fuel-efficiency figure of 23.27 km/l. The new Camry has brought with it new styling, which is evident from a completely reworked front fascia which now features a new headlamp design, L-shaped tri-band LED DRLs incorporated into the LED projector headlights, a new grille design and a large, multi-slat air dam. With the new styling elements in place, the 2019 Camry does shake off its 'too mature' styling and opts for a fresher and sharper appeal. This will definitely make the car more appealing to younger buyers. In an extension of the younger appeal, the car gets 18-inch alloy wheels and slimmer LED combination tail lamps. The seats have been finished in all-beige leather while the door cards and dashboard feature a two-tone finish. Moving on to comfort and convenience, the 2019 Camry comes with features like a 9-speaker JBL Audio System (ditching the post-upgrade 12-speaker system of the outgoing model), an 8-inch multimedia touchscreen, paddle shifters, three-zone climate control, rear seats with power recline and trunk access, rear power sunshade, 10-way power adjust seats (Driver and Front Passenger), electric tilt and slide moonroof, Heads-up Display and Cruise Control. The aspect of passenger safety also remains well looked after with the 2019 Camry retaining its 9 airbag layout. The list of accompanying safety features includes ABS with EBD and Brake Assist, Vehicle Stability and Traction Control, Brake Hold Function and Parking Assist (Rear parking sensors and reversing camera). In India, the Toyota Camry competes with the Honda Accord Hybrid, Volkswagen Passat and the Skoda Superb.